The female hormone estrogen has a variety of roles in brain and behavior. One of the most recently discovered is a role in protecting the brain from damage and in influencing the brains ability to repair itself. Because cerebellar damage increases estrogen synthesis, we are testing whether estrogen plays a role in how birds with lesions of the cerebellum recover from damage to this brain region. 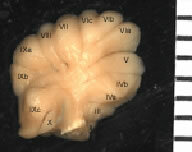 Just as the beak of the finch is shaped by evolution, so to is the brain. For example, a part of the brain known to be involved in memory for locations is particularly large in bird species that hide their food in caches and later must remember these locations in order to retrieve it. We are currently investigating whether a motor learning region of the brain, the cerebellum, is larger in species that perform complex physical displays in order to attract their mates compared to closely related species that perform simple or no displays. We are working with manakins, family Pipridae. Many species of this American tropics family produce amazing high-speed acrobatic displays. In addition to our evolutionary studies we are involved in studies that investigate the biomechanical production and hormonal regulation of the display. Many of these studies are done in collaboration with Barney Schlinger.